Jay P. Fosgitt is a commercial and comic-book artist — among other projects he was the illustrator of Old McMonster’s Haunted Farm (written by Brent Erwin), which we made note of here previously. 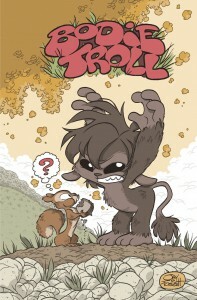 Now one of Jay’s latest projects (as writer and illustrator) is a full-color comic called Bodie Troll. “Jay’s creator-owned, all-ages comic set in the mythic village of Hagadorn and featuring a grumpy little troll named Bodie. While he aspires to be big and scary, he’s actually cute and cuddly, which confounds his attempts every time.” It’s available now from Red 5 Comics. Check out Jay’s web site to find out more about this and other projects, as well as his commission rates. Yes he does.